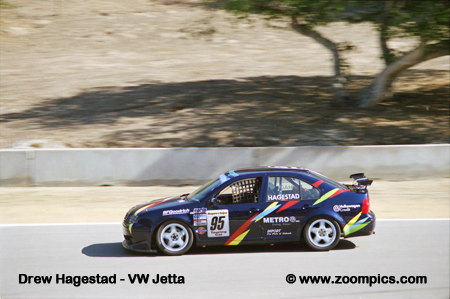 Round eight of the World Challenge series was held at the Laguna Seca road course. The eleven-turn 2.238-mile road course is located in Monterey, California. 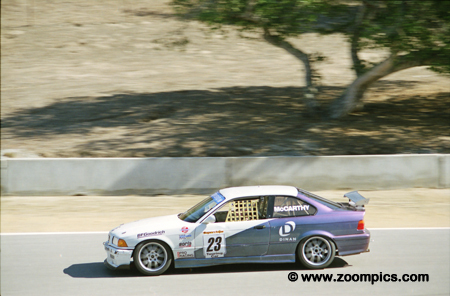 Alfred duPont driving a BMW 328is captured his first career World Challenge Touring win at Laguna Seca. 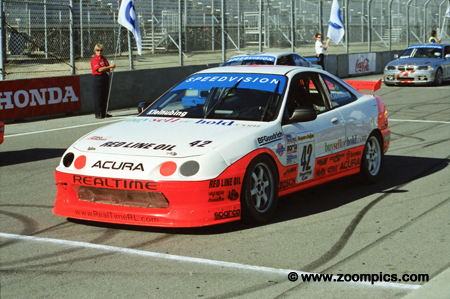 DuPont qualified on the pole and led every lap despite a challenge from Hugh Plumb driving one of the RealTime Acura Integra Type Rs. His margin of victory was 1.175-seconds over Pierre Kleinubing also in a RealTime Type R. In addition to his win duPont received a 10-point penalty for a driving infraction. 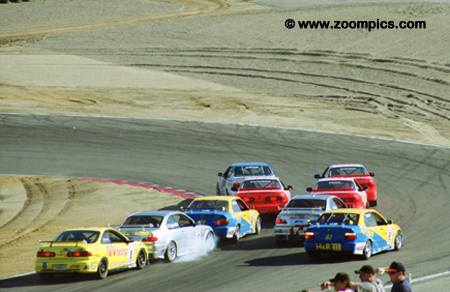 Lap-1 of the World Challenge Touring race at Laguna Seca’s tight turn two. 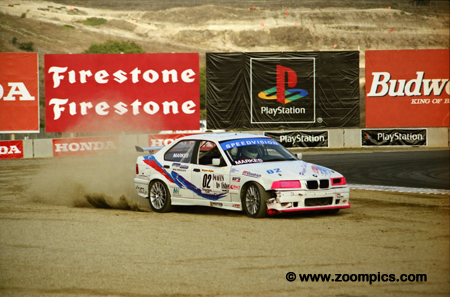 Taz Harvey makes good use of the superior braking system on the BMW to stop his Acura Integra Type R. The incident sent Mike Fitzgerald and one of the Turner Motorsport BMWs off course. Fitzgerald was able to work his way back to a fourth place finish. RealTime driver Hugh Plumb qualified fourth but quickly moved up to second in the race and was able to challenge for the lead. On lap-23 he attempted to pass race leader Alfred duPont at the 'Corkscrew', however, there was contact which sent Plumb off the track and into third place where he would stay for the remainder of the race. 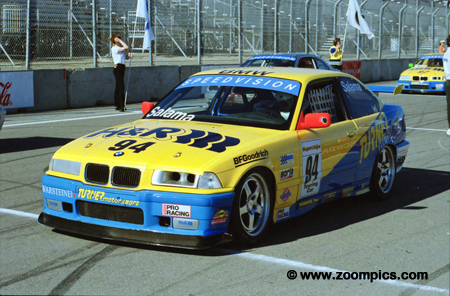 Don Salama drove this Turner Motorsport BMW 328is at Laguna Seca. Salama, who was in his first year of World Challenge Touring competition, qualified fifth and finished ninth in this race. Despite a number of good finishes, including a win at Texas Motor Speedway, Salama would finish second to Neil Sapp in the 'Rookie of the Year' standings. Walter Markes Jr. slides off the track at Laguna Seca’s final turn during practice. Markes qualified twentieth in the Peppaseed Racing BMW 328is and finished fourteenth in the race. He completed all rounds of the 2000 season with the exception of Sears Point and finished eleventh in the final Touring Car standings. 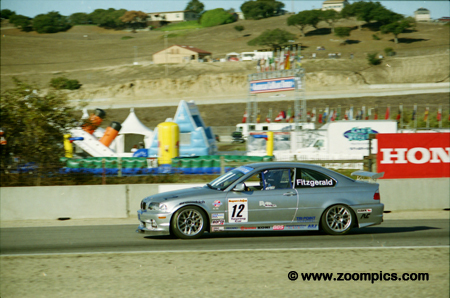 One of the outstanding performances during the Laguna Seca event was provided by Terry McCarthy. 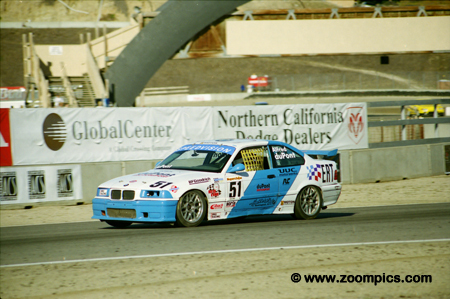 McCarthy, a California native, used his local track knowledge and skill to move from his thirty-fourth starting position to a fifth place finish in his BMW 328is. Unfortunately, he received a $100 fine for an inappropriate gesture during the event. It is hard to believe that qualifying third would be considered a poor performance - but it was for Pierre Kleinubing who started from the pole five-times during the 2000 World Challenge Touring Car season. He trailed Alfred duPont and teammate Hugh Plumb for much of the race. When duPont and Plumb had contact at the 'Corkscrew', he settled for a second place finish. Mike Fitzgerald qualified the TC Kline entered BMW 328CI seventh but the first lap incident at corner-two knocked him down the running order. He was able to recover and worked his way back to a fourth place finish. In the previous event at Road Atlanta Fitzgerald scored his first Touring Car win. The third member of the TC Kline team was Shauna Marinus. 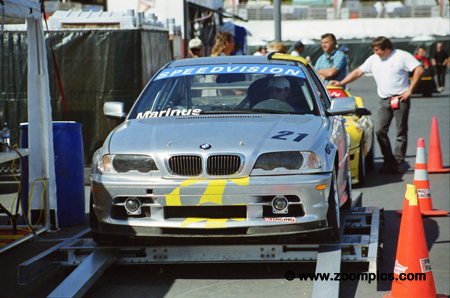 Marinus was a very talented driver who had won many Sports Car Club of America National Solo Championships. 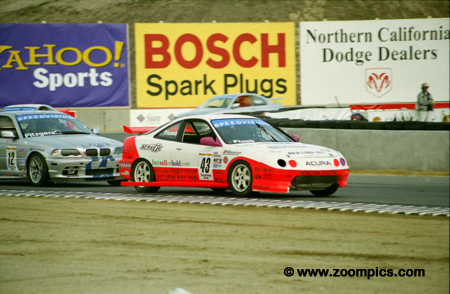 At Laguna Seca, she started sixteenth and finished tenth.